The ASD20 Aspiration Smoke Detector consists of an analysis chamber with one or two smoke detectors, which can be of conventional or analogue technology, ionisation or optical. The smoke reaches the analysis chamber through the installation pipes after having been sucked in by a turbine inside the ASD20 system. An electronic circuit controls said turbine and the air flow, giving off a fault signal if the pipes are broken or if the air intake is obstructed. 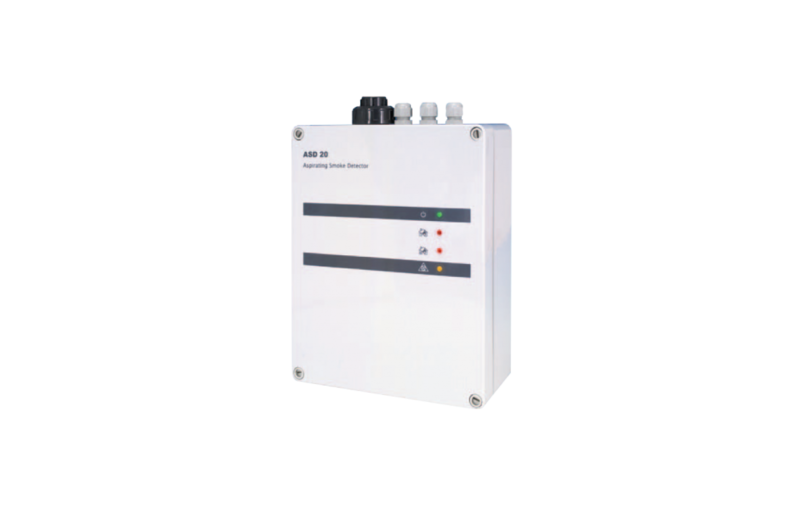 It has two voltagefree relays for local manoeuvres, one per detector, and a third system fault relay. When analogical smoke detectors from the 700A series are used, it is possible to adjust their sensitivity levels from the fire control unit.